Today, the Class 4A Greater St. Helens League teams are featured. Over the next two days, the Class 3A and 2A Greater St. Helens League teams will follow as will the Class 1A Trico League team reports. The Camas Papermakers are back to a couple of familiar things. Back to winning, and in Week 2, they made it back home. Camas opened the 2018 season on the road, losing by two points after an incredible comeback from a 31-0 deficit. In Week 2, the Papermakers returned to victory by returning home, recording a 52-0 victory over Hazen. That pushed Camas’ record at the new Doc Harris Stadium, which opened in 2010, to 45-3. 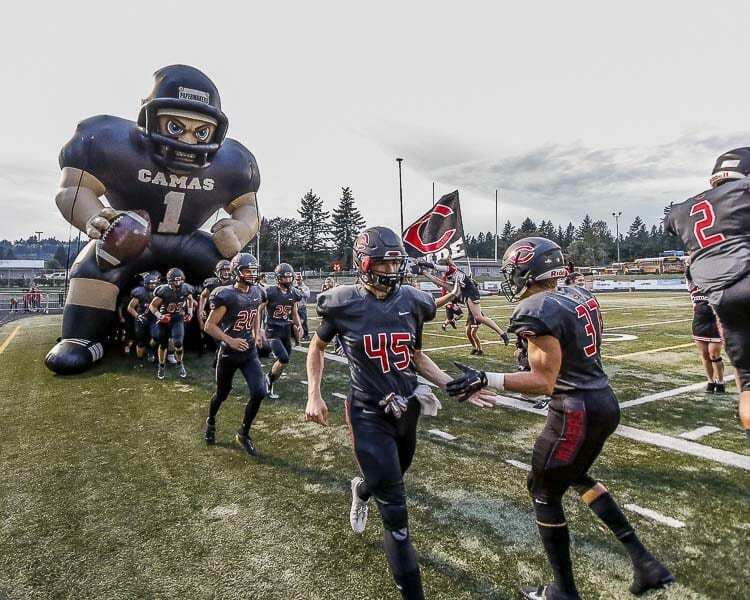 Camas has been the dominant program of Southwest Washington for a decade, so its home record should not be a huge surprise. Talent, work ethic, and coaching are keys to that success. Still, the Papermakers also believe they have a true home-field advantage at Doc. It is more than a game there. It is more than a school event. It is a community event. To open the 2018 home schedule, the Papermakers made quick work of Hazen. Luc Sturbelle caught a touchdown pass from Jake Blair, making his first start at quarterback for the Papermakers, in the first quarter. Randy Yaacoub had three rushing touchdowns for Camas. The Papermakers made it a running clock, up by 40 or more, midway through the third quarter. And Blake Deringer had a touchdown on offense, plus an interception return for a score. As most coaches would say after Week 2, still plenty of work ahead. The Skyview football players are probably having a bit of fun with their fans in the student section this week. After all, fans can get a little carried away in a rivalry game. Especially with the logistics of a Columbia River-Skyview game at Columbia River High School. A brand new turf is awesome, but for now, not a whole lot of seating on the visitor’s side. So when there is a big game – such as rival Skyview – the opposing student section just stands along the rope line near the Skyview sideline. That puts those students in prime position to rush the field when the game is over. Or, in this case, when there is a second left in the game. 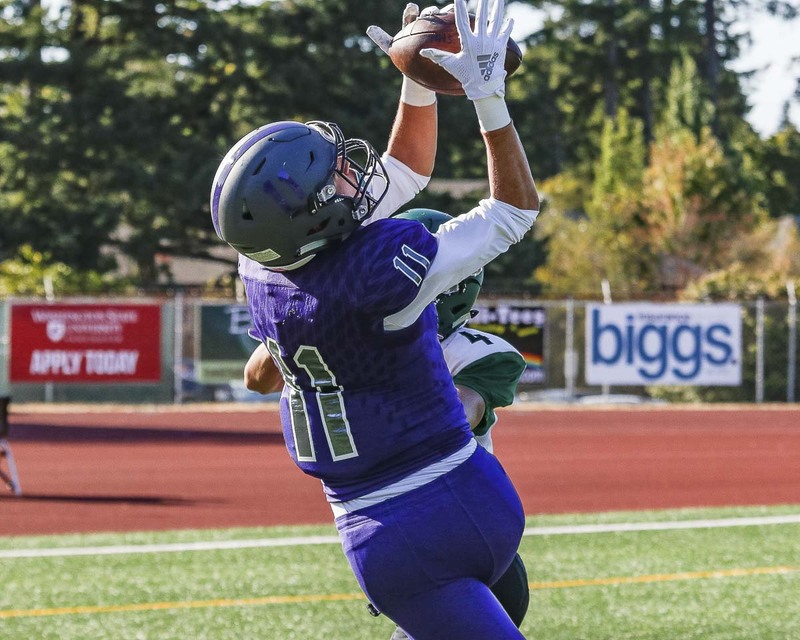 Columbia River was trying to avoid the shutout and was executing a great 2-minute offense. The Chieftains reached the 30-yard line as the seconds were ticking away and spiked the ball with 1 second left on the clock. The Skyview students did not notice that, and thinking the game was over, they rushed the field to celebrate. That was a 15-yard penalty accessed to their team. The next play, Columbia River scored. 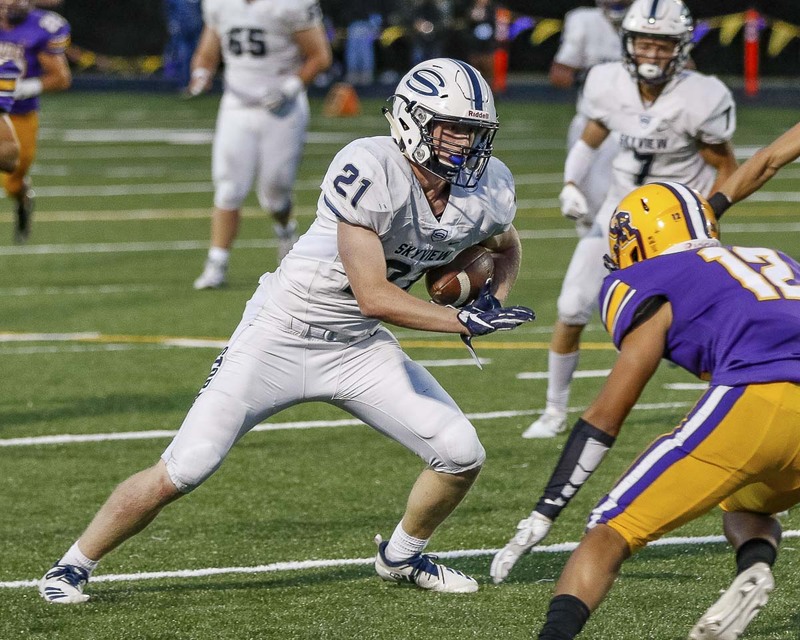 Technically, the Chieftains might have been able to score from 30 yards out, but the Storm coaches and players all felt they earned a shutout. Officially it is not a shutout. But it is a victory. Oh, and there has been a lot stranger ending to a game in this rivalry at Columbia River High School than a penalty on the students. And it is not the last time Columbia River has scored a touchdown on the final play of a game in this rivalry. But Skyview coaches jokingly told me I was not allowed to bring that up anymore. Apparently 2013 has been erased from their memories. For the Storm, though, at least the strange ending finished with a Skyview victory. Some numbers: Yaro Duvalko threw for 222 yards and four touchdowns for the Storm. That gives him nine TD passes in two weeks. … Jalynnee McGee did not get in the end zone but certainly put his team in position to score several times. He rushed for 132 yards on 15 carries. … Mason Wheeler had a big scoring night, returning the opening kickoff for a touchdown and also catching two touchdown passes. … The best receiving performance of this night came from the hands of Gavin Baskette. He caught six passes for 108 yards and a touchdown – all in the first half. In Week 1, the Heritage Timberwolves needed a last-minute touchdown to win. In Week 2, the Heritage Timberwolves needed to execute to save a win. The Heritage Timberwolves are 2-0. A perfect record, but Heritage coach Matt Gracey said this squad is far from perfect. He was referring, specifically, to the big lead the Timberwolves had in this game — up 24-0 and 31-7 at times — but then it becoming a three-point game. However, his players did respond in the clutch again. “Nice thing about it, when it came down to winning or losing, we decided to win,” Gracey said. Plus, the Timberwolves had to overcome the temporary loss of their starting quarterback. Nikki Scott left the game in the fourth quarter as Heritage was up 31-28. Skyler Scoggins came in to help the Timberwolves finish the drive, and, yes, secure the victory. One play after being sacked, Scoggins connected on about a 30-yard pass to Jordan Oliveras to the 2-yard line, setting up the final touchdown for the 38-28 victory. “Jordan made a helluva catch,” Gracey said. He was just one of several playmakers on this night. Robert Meadors is now playing in college. Gracey said last year, the team kind of just waited for Meadors to do his thing. This year, they are beginning to realize that they all are capable of making significant contributions to the cause. Gracey named a few: Oliveras, Scoggs, Scott, Daniel Berrera, Kahai Umiamaka, Anthony Kee, and Isaac Roa. The running backs, in particular, are making life easier for the coaches. “They did a good job of running hard and running the way we want them to run in our offense,” Gracey said. On defense, Heritage forced a number of turnovers, and then the Timberwolves converted those into points. Umiamaka had a pick-six, Berrara almost had a pick-six, but instead that interception led to a field goal. Josh O’Neal recovered a fumble that led to seven more points. It was a homecoming of sorts for Battle Ground’s head coach, and an awe-inspiring place to compete for the Battle Ground players. The Tigers played in the Seattle Memorial Classic at Memorial Stadium in the one of the most picturesque parts of the city. Kesler played for Lincoln High School of Seattle back in the 1970s. Memorial Stadium was home. Oh yes, the new scoreboard this year was a big hit with the journalists covering the event this year, which featured five games over two days. The past few years, many of the lights on the old scoreboard were out, making it impossible to see, at times, just how much time was left in a quarter. Interestingly, Kesler said when he played in the 70s, there was a state-of-the-art scoreboard that lit up when a team scored. Not sure if that was the same one that had been used, but now there is a fancy board there for any future Clark County teams to look forward to if/when they get invited back to the event. As far as the game, well, that did not go so well for the Tigers on that scoreboard. Rainier Beach finished second in the state last year at the Class 3A level. And Beach looks strong again this season. Still, it was a 14-7 game at one point. Seth Workman found Boden Strouse for a touchdown. And it was not just some fluke play. From there, it was all Rainier Beach. “We battled hard. Some of the inexperience is still showing,” Kesler said. “All in all, Rainier Beach knew they were in a battle. We battled the whole game. Unfortunately they crossed the goal line more than we wanted. A tough schedule is part of the growing pains. In fact, Battle Ground plays another strong 3A program next week against Mountain View. Kesler was an assistant under Jon Eagle and Cale Piland earlier in his career. Those two have led Clark County teams to state championships. Those two were never afraid to schedule top teams.